A well-dressed man with a huge bouquet of flowers or in this case leaves will send most lady’s heart a flutter. My hubby would be the one to bring me leaves. My hubby is not a romantic in any sense of the word. He doesn’t spontaneously bring me flowers or gifts. And he certainly doesn’t cook or do dishes. But that doesn’t mean that I am not completely in love with him. Because I am. I have learned through the years that love is more than just little love tokens, ‘things’ that are tangible and that tingly feeling that disappears after the first few months of marriage. I would love for him to do all those romantic things that couples in movies and books do but that is just unrealistic. Right off the bat in college when he took me on our first ‘meal’ date to the Campus Grill, he told me he wanted to buy me dinner. And in the same sentence said it had to cost less than $4. What? No one can get a meal and a drink AND dessert for that much. I’m not going to lie. I felt a little insulted that I wasn’t worth more to him than a few bucks. I came away thinking he should have been willing to drink water so I could have french fries with my sandwich. Haha! Those are a few examples of how we do romance in our home. To be honest, the problem is on my end not my hubby’s. I came into marriage with expectations. Expectations gleaned from immaturity and too much book reading. I love a good romance. I love how Mr. Darcy goes to the ends of the earth to find Lydia Bennett and Mr. Wickam so that they can be a respectable couple. And how he rights a mistake and sends Mr.Bingly back to Jane. All for Elizabeth. He did it all to show her he loved her. And that is what my hubby does for me. He gets out of bed every morning and sets off to work. He comes home and interacts with our children, showing them love, patience and is an example of a good father. He is a hard worker and doesn’t take shortcuts. He teaches our children to respect and obey me. He listens to my endless chatter and ramblings. He shows interest in my crafting and encourages me to take it further than just a hobby. I won’t bore you even though my list is SO much longer. I have realized that although it is fun to receive gifts, if your romance is solely based on’things’ it is shallow. Real romance is sticking with someone through life’s difficulties. Being there when it is important and doing the hard work (parenting, marriage). Choosing to love the other person even when they do it wrong or get under your skin. I am onto my third prompt in the #thestencilfiedjournal challenge. Yes, I skipped #2 but I am coming back to that as I misread the prompt. Stencil on a leaf. I considered using a real leaf but I have had these little ones lying around on my table for forever. I am desperate to use up what I have so faux leaves it is. I used the Ornamental Floral Screen on the leaves and then embossed them in green. My background is a combination of the Ornamental Floral Screen and the Eye Lattice Stencil. I used various paints, stamping and embossing in my background. The tag has been re purposed from a previous project. I added more stamping, paint and embossing as it was previously Christmas themed. On the opposite page I have old book paper, vintage lace and fabric scraps surrounding one of my pair of hand-carved fish. I finished off with some thread, doodling and a few other embellishments. What a lovely read this was! It was really nice to see a glimpse into your “romantic” life, which sounds normal to me! Sometimes I wonder how real life is for other couples, and it’s nice to know that it doesn’t seem too different from mine. LOL! I had to laugh at your dating experience. Sounds like you were never a struggling college student who was on a tight budget. It’s good to read that material things are not as important as actions. We all find reasons to love someone,. Your layout is beautiful. You have a way with texture paste and layers that build up like the stories you share with your layout. This is adorable. It’s also a great layout for Father;s Day. Amazing mixed media works, Kate ! Love the colors , textures, and layers so much and I enjoyed every single detail on your art. Thank you for joining us at Simon Says Stamp Wednesday Challenge. WOW WOW WOW!!!! 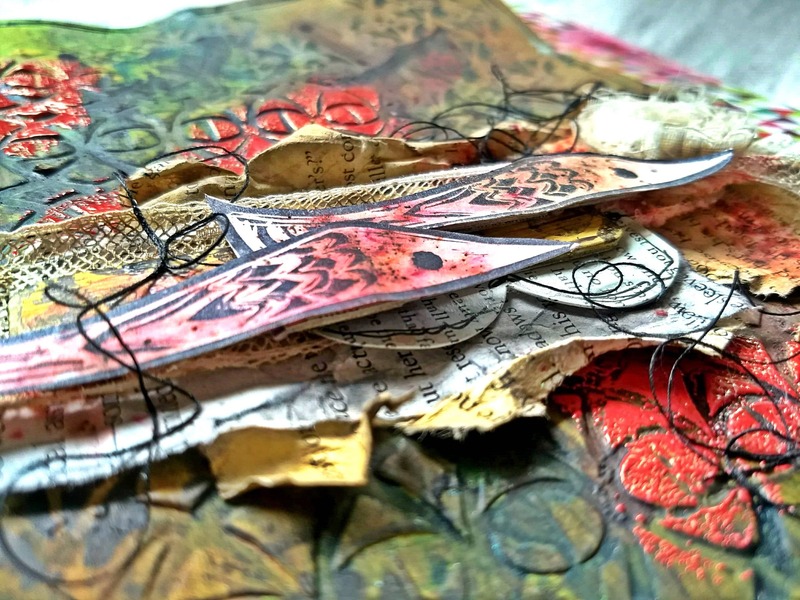 Triple wow’s for this AMAZING and super textured art journal page!!! So yummi!! Love the colors and the way you created your background! I am in awe of mixed media paradise!! Thank you for playing along with us over SImon Says Stamp monday challenge, we all hope to see you again next week! A wonderful so unique and textured so very beautiful! Oh Kate! How I laughed and was shaking my head yes, when I read this! anyway, this time around, I know what a sh-t-show, real marriage can be sometimes, but I vowed to work through everything with this one if the good Lord above gave me a second chance. And I am happy to say 14 years and counting, we get better each year! Believe me the 1st few years and two sets of older children were difficult, but we are on to the years of, we just know and love each other so much that life is a bit smoother and easier! Ahhh enough of me…onto your journal! ps..how did a gal of your youth get so wise? Not sure how I managed to miss this one, but I just wanted to come by to say , love it!! Wow, such an fantastic project!! The details are amazing! Thanks so much for adding it to our Stencil It challenge at A Vintage Journey! You have framed him just perfectly! Thank you for joining in our challenge at SanDee&amelie’s Steampunk Challenges! Absolutely stunning Page! Lovely textures! Thank you for sharing it at SanDee&amelie’s Steampunk Challenge! Kate, when I opened your page, my jaw hit the table! Wow! That texture, those colors! Love this to bits! And what a wonderful, heart grabbing post! You said a mouthful, girl! Good for you to recognize what true love is! I think I’ll just leave it at that, and say I am sure you and your hubby are going to enjoy a long, happy life, no matter what comes your way! Hugs! LOVE all those textures in your page – the man with the leaves and the connection to your husband – brilliant! I laughed all the way reading through your post because my husband is EXACTLY the same as yours LOL! On our first date we ate a horrible burger on a cold park bench in February (two days after Valentine’s Day), He told me we could have gone to a restaurant but it would have been more expensive. I thought he was just testing me to see if I was only after his money, but later I realized that’s just the way he is LOL. Frankly, if he came home one day with a bunch of flowers, I would be suspicious and worried because it’s so unlike him. On the other hand, he has lots of redeeming qualities – and yes doing DIY is one of them! He’s also super reliable and trustworthy and he has a habit of appreciating old things and looking after them – a good indication that he will never want to replace me for a newer model LOL. I think we both married the right guy!